Christmas is coming, the goose is getting fat and it’s about time we had another competition around here. Once again, our chums over at Art of Football are offering a stellar prize in the form of a t-shirt from their brilliant and ever-swelling catalogue. Art of Football cater for a wide variety of club tastes – from Ajax to Wolves and everything between – as well as international sides and World Cup legends. Basically, if you want a quality t-shirt with an artful print of Dean Windass on the front, they’ve got you covered! So, to win a t-shirt of your choice from their massive selection, all you need to do is answer the following question and then cross your fingers that your name gets selected from the correct answers. 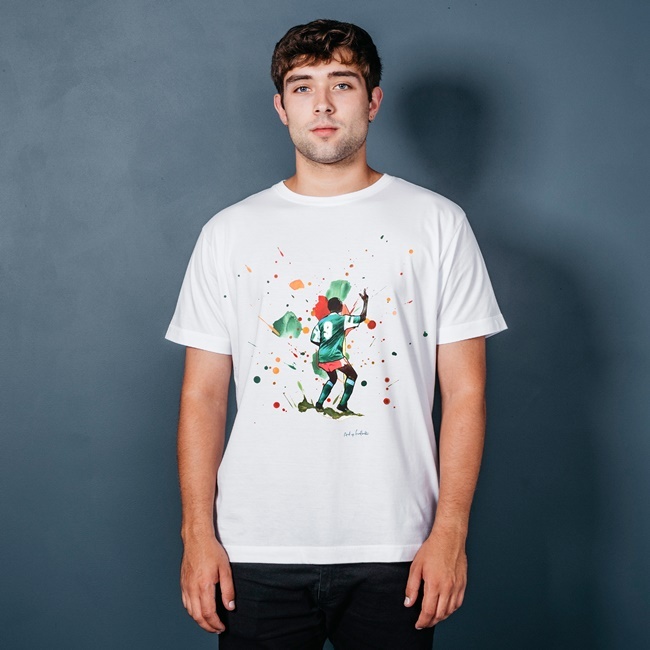 Question: Who is the Cameroon icon jigging away on this Art of Football tee? Please email your answer (simply A, B or C will suffice) to us at waatpies@gmail.com with “AOF COMP” in the subject field. We’ll pick one lucky winner at random when the competition closes at midnight (BST) on Thursday 14th December. The winner will receive their choice of Art of Football t-shirt. 2. The competition closes at midnight (BST) on Thursday, 14th December 2017.